How do you say “cheers” in Austria? The local equivalent for “cheers” is “Prost”. A simple pronunciation guide is to ensure it rhymes with “toast”. It’s not perfect, but it’ll do. Instead of Prost, you can say “zum Wohl” (which sounds a little like zoom vole), particularly if drinking wine. This expression, which means “to your health”, is slowly dropping out of fashion. Whatever you say, it’s not usual to mix terms. So when the first person says Prost to you, say Prost back. It’s bad form to start your beer before you have said Prost to everyone. Think of it like queue jumping in England. If someone joins the table late, you can even find people apologising for having started before saying Prost to them. This is a horribly nuanced one. If people are out of reach, you raise your glass at them instead of clinking. If there is a large group of people out of reach, you may raise your glass in their general direction and be excused the requirement to toast people individually. (It takes years of experience to know the exact distance at which people become “out of reach” and the number of people required to turn a set of individuals into a group). If you are the only one drinking then a general “Prost!” to everyone is perfectly acceptable. 3. You look each person in the eye as you say “Prost!”. This is important. It is not a time for modesty or introspection. It is a time for declaring yourself ready, willing, and of brave heart and sound spirit. Congratulations: you are now Austrian. P.S. I may have exaggerated some of this information. 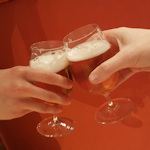 But the general points stand: say Prost, clink glasses and look them in the eye as you do.